SPX: Quite a volatile week especially on Thursday and Friday with two strong selloffs. Even though the market was able to close the week above 1100 for the first time this year. My Elliott Wave count is still spot on for the second week in a row. : ) As expected last weekend the rally resumed and made a new high near the 50% retracement level. 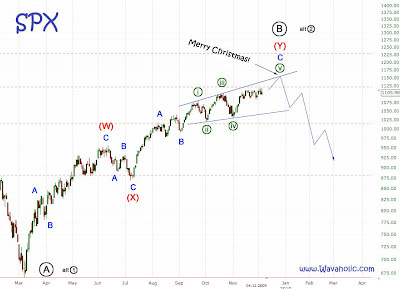 I count last week's rally from 1084 to 1119 as a wave i of (c) and the drop from 1119 to 1097 (a perfect 62% retracement of wave i) as a wave ii. So, next week wave iii should follow and reach 1150+. Although I expect the top to be around 1160 it's also possible that 1119 was the top as you might have seen it on other blogs. A first indication that the top is in would be a drop below 1084 and a confirmation below 1029. That's my count for the whole bear market rally so far: A double zigzag. 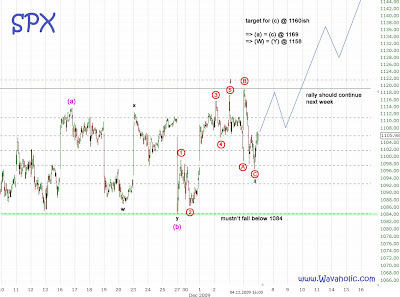 At 1158 wave (Y) would equal wave (W). USD: For the second time after August the Elliott Wave count for the Dollar looks like it has completed 5 waves down. That would mean that the Dollar bottomed in late November and is now in the early stage of its last rally before it will totally collaps. As soon as this rally is confirmed it should last several months or even years. This chart shows why I think that the top is still some weeks away. 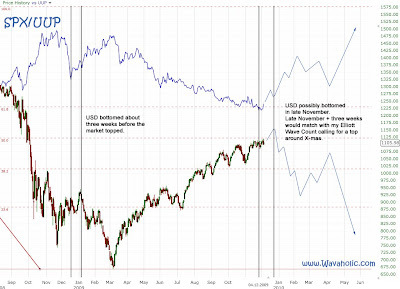 About one year ago the USD bottomed in mid December. That's about three weeks before the market topped in early January. We might get the same picture this year with a bottom in the Dollar in late November and a top in the markets in mid-late December.